Editor: I looked at Lee Roger’s Camino/Blair Mill website but didn’t see any reference to this video. I find it quite remarkable. Take a look at this wonderful 16 mm film of the mill. Editor: These photos and text were sent to us by Lee Rogers who grew up at the mill. 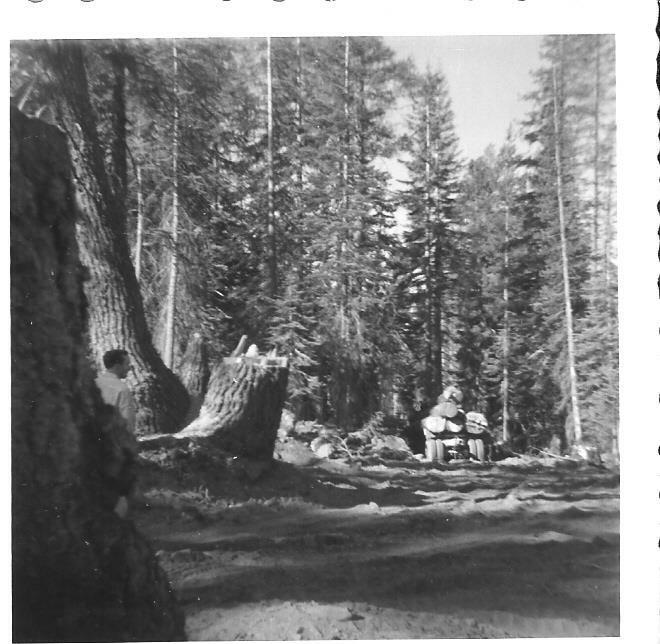 Some of the photos are of poor quality and the page may only be of interest to those, like me, who had spent time in Pacific House or that area. The museum thanks Lee for sending these along. 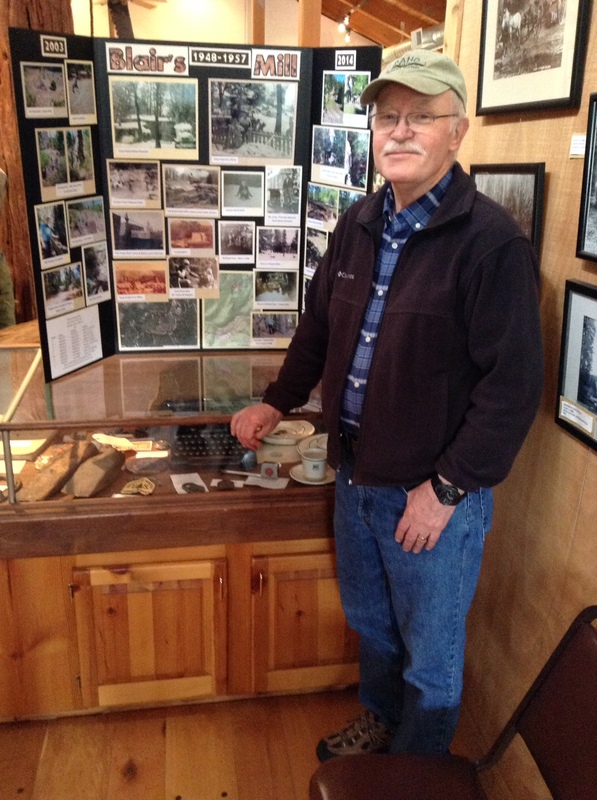 This is Phil Tuma who came to the museum recently and left, on loan, this display board with photos of the Blair Mill. We’ll have it on display until early Fall. 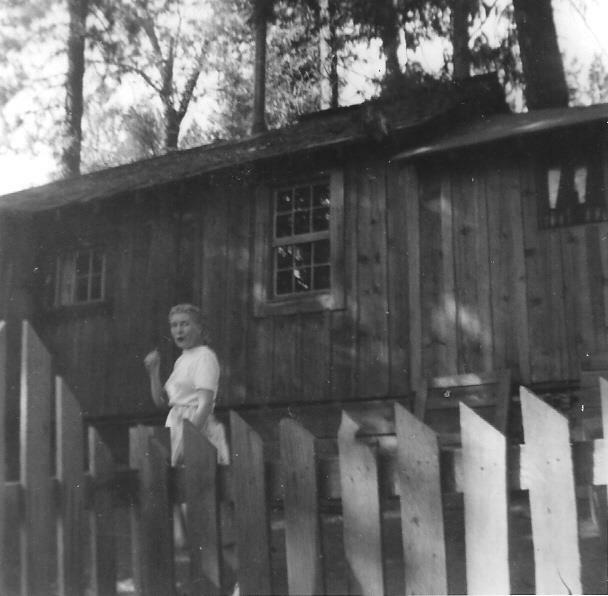 I was Born in The Placerville Sanatorium 8-52…My Father Worked for Blair Brothers Lumber Co. and we Lived in one of the Small Houses Below the Saw Mill, up behind Pacific House…We Lived in 3 Places, while at Blair’s… We Moved out of Blairs When they Sold Out to Michigan Cal Lumber Co. About a yr before the Ice House Fire. 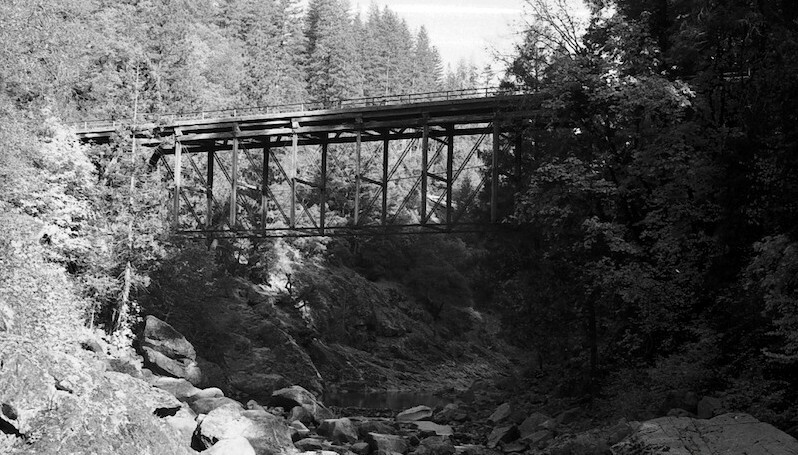 To Get to Blair’s Mill, you Turned off of 2 lane Hwy 50 at Pacific House, dropping down a dirt Road to The Blair Bridge, Crossing the South Fork of the American River. 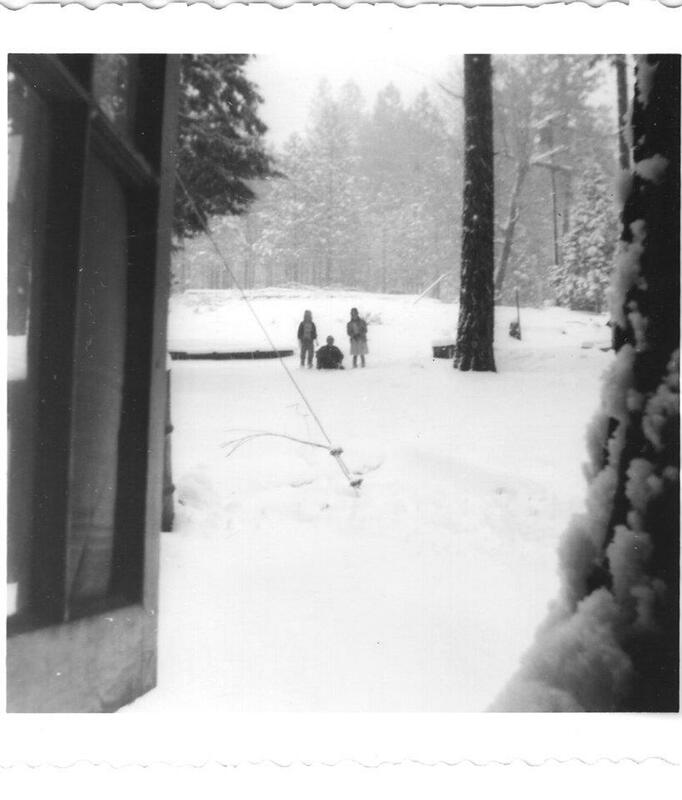 We Lived at Blair’s year Round, and kids Had Lots to Do…. Kids Playing in Snow Up Behind Our House… Not Sure Who The Kids are…. 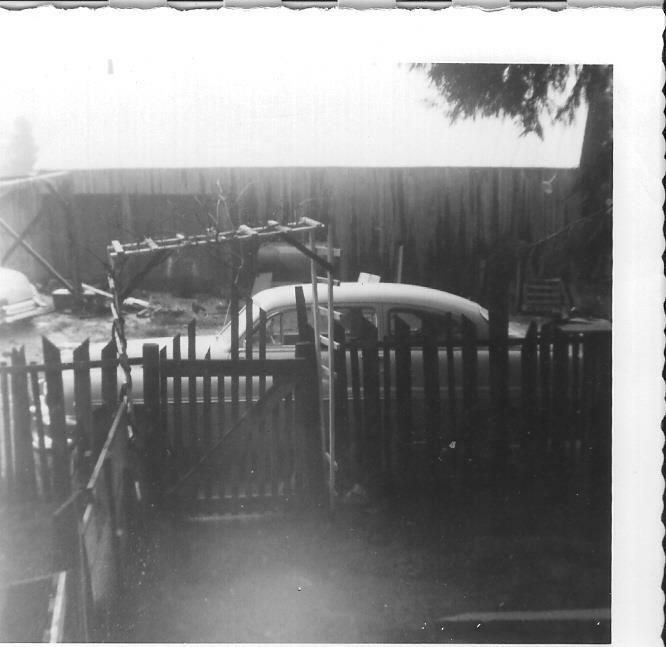 Looking out Our Gate…Truck Shop, below our House…. Our Next Door Neighbor, (Phyllis Tuma, see the comment further down), her Husband Drove the Ambulance, and took me to the Hospital when I was Poisoned…This Became Our 3rd and Final House at Blair’s…There’s a Tree…Growing Through the Back Porch…We had Oil Heat…Electricity…And the 1st TV…At Blair’s Mill…One Night, after Dad got off work, Swing Shift, he said he had turned on the TV, and Picked up Oaklahoma City…..On The Skip…..
Yes…We Had our Own Dump, Below the Mill…..and we had Bears Too…..
A Rare Cinnamon Bear, in the center of Picture, in the Dump…. Thanks for the pictures Lee. Brings back memories of Blairs mill. Looking at the pictures makes me think that I could have been there when you were born. The house that you lived in, just above the shop, was inhabited by a young teacher just out of college. Her name was Miss Knight and she taught us for one year in the newly built Big Bend schoolhouse. There were three teachers that taught us during the time we lived there and our school was during the summer months as the snow prevented winter classes. The grades were 1st. to 8th grades. 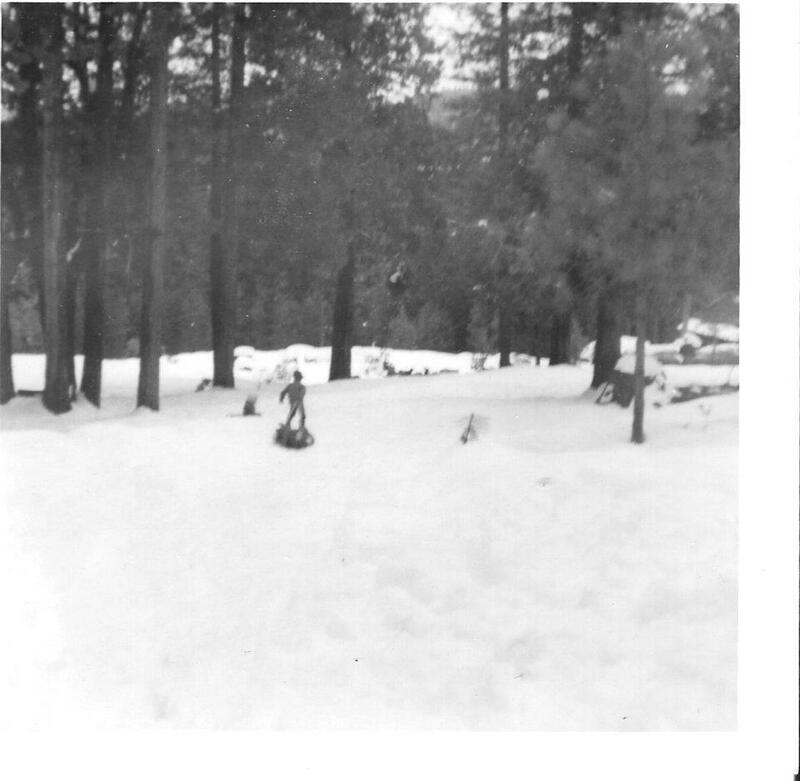 That hill where the kids were playing in the snow was the same place we rode scoop shovels and toboggans. Our house would have been up the hill and to the right of your house. It was on the same level as the schoolhouse which was just a short walk to the west. We had two wood sheds but had to turn one of them into a bunkhouse for me and my three brothers. The two girls got to sleep in the house. We had two out houses, one close for winter an one up the hill away from the house for summer use. We finally dug a septic pit and installed a flush toilet. My mom cooked on a wood range and our heat was a pot bellied stove in the living room. 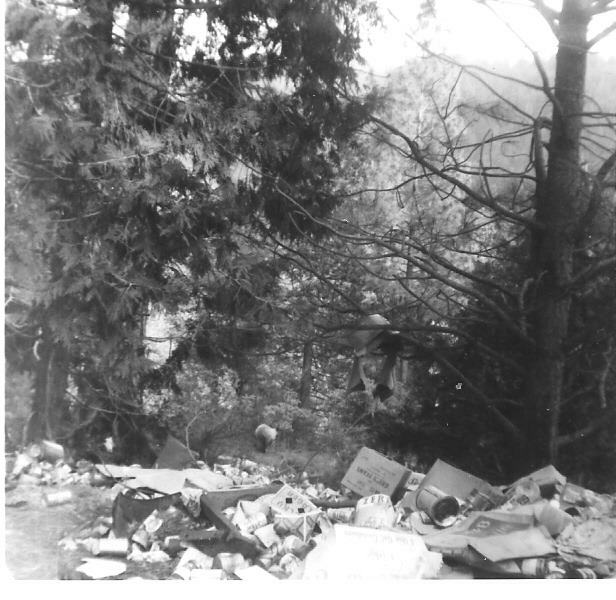 As for the dump site, as I remember, it was west of town on the logging road between the camp and the Van Fleck corral. When we had visitors from the city, we always took them out to the dump at dusk to show them our bears. A short distance past the dump was a place called “Indian Hattie’s” Art Blair told us about an old woman that built a ceder bark shelter and lived there like her ancestors had. There was a single shelter there all the time I lived there. The mill site was built on the site of an Indian village. We found grinding rocks where acorns had been milled. Under the lumber drying trestle, you could find arrowheads after each storm. The dripping water from the trestle would placer mine the dirt below and expose the arrowheads. I could go on forever but perhaps would be boring everyone to death. Didn’t bore me, thank you George. Not Boring Anyone George….My Dad Bought me a Full Set of Tonka Trucks and The Hosiers and rest of the Kids, we would Sit on them and Ride them down the Hill Between the Houses….There were 3 Houses where you were talking about Hosiers lived in the Center House….At the Head of the Log Deck was a Big Stump, and the bank was Adobie Clay….we used to Make Clay Figures and set them on it to Dry…There is still an old Coupe Sticking out of the fill, that was the Log Deck, where Pevine and white Meadows Roads come together….What I always thought was a 20-30 ft bank as a kid….was only about 8′, when I saw it around 1974…. Check out my FB Page Lee Rogers …To see the Pictures I took of the Area Sept 2013…..It ALL Burnt up Last Fall, in the King Fire…..
Phil: I remember you and your parents very well. you were just a small tyke when we lived there. We sold our place when we left and I am not sure who bought it but it sold for only about $400. Your dad was a good man and I remember when I had a problem with a bad tooth that had to be pulled. He volunteered to take me to Placerville to visit the dentist and have it extracted. After it was pulled, he took me to Max Jumbo’s soda fountain and bought me my first malted milkshake. I loved watching him work in his gun shop. 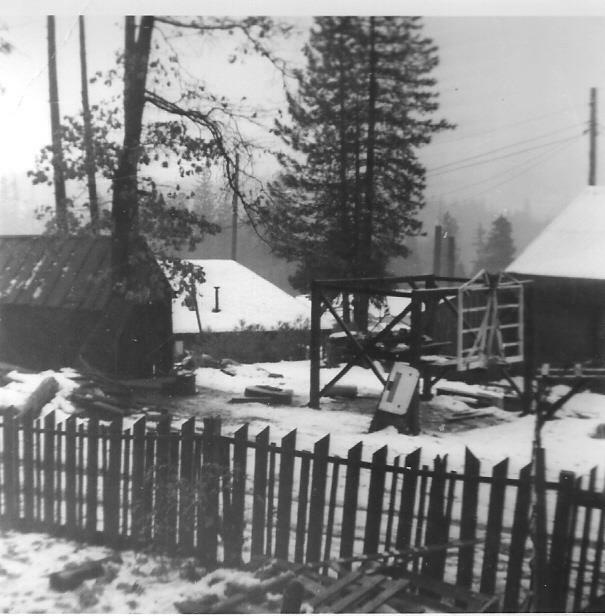 We always wintered in camp while most of the families left because of the snow. I had the job of feeding and watching after the animals that were left behind by many of the families. I would snow shoe to each house and open cans of cat or dog food to feed the pets. Most paid me in the spring when they returned. Your dad gave me the choice to take money or a gun. Of course I chose the gun. It was a Stevens Crack Shot 1919 22 cal. single shot that your dad had replaced the firing pin. That gun about decimated most of the grey squirrels, wild pigeons and quail in that part of the country. I still have the gun. You’re welcome. 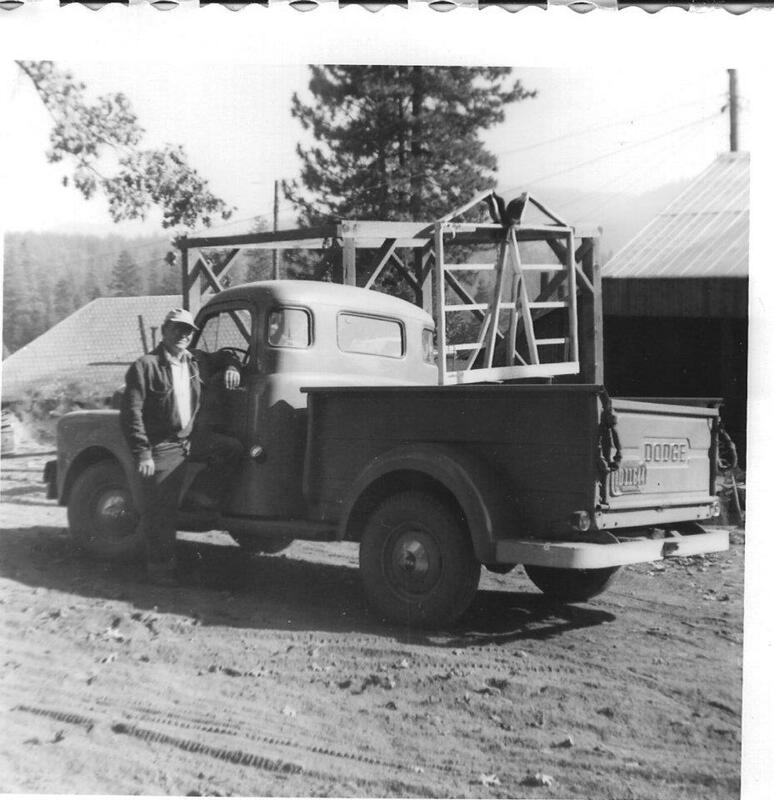 Thanks to all of you in Eldorado County who have contributed so much history by way of your comments to the web site. My dad, Leo Lewin (everyone called him Pinky) was the camp cook. 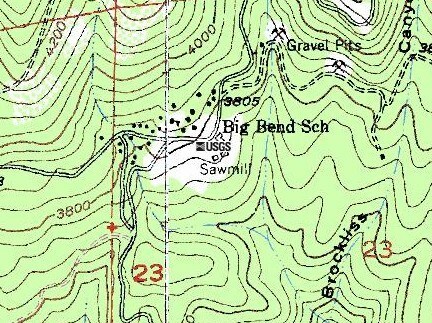 From 1952 until 1956 we lived at Blair’s Mill, in the cook house. We had two rooms and a bathroom, 7 people. What a life we had, we all look back on those times as golden, tinged with gold, the best time to live in America. 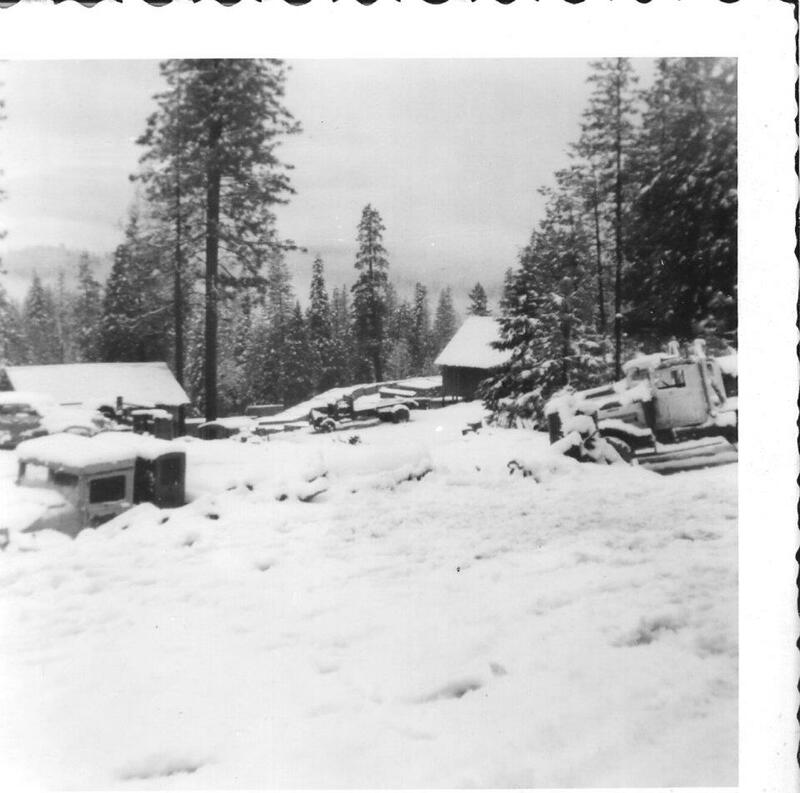 We would come up there after we got out of school in Placerville (dad would go up in May to get things started.) and we’d spend the summer, most times returning to Placerville in September or October. So, we’d take the school bus to Pollock Pines Elementary. The glorious sour smell of pine wood drying. The crunch through your toes of dried dust after the water truck had been through. The cold cold water from the underground spring. Dad killed a bear, I think the first year we were there. I’m watching this film loving it. Bill Blair is talking about things I remember. Ron Blair and my brother, Bob, were great friends. George Lucas or Lukas, every Tues. night the kids at the Mill would go to the old school house and George would tell stories from the bible, and as he would tell these stories he’d draw pictures of all the characters he was talking about, using butcher paper. Wish I had some of those drawings today. The swimming hole, Lord, that was a place to be during the summer. Had to climb down to the hole, occasionally someone would kill a rattler and there the body would be beside the path. Great swimming hole. Sharon Tuma and I were great friends. More friends were the Tucker girls, Bonnie and Becky – their dad was there first then he brought the family out. Hello Cynthia. I am an older sister of Becky And Bonnie Tucker. You may remember me as one year I lived with your family in Placerville so I could go to school. I have enjoyed reading your memories as I have so many of the same. I regret to tell you that Becky and Bonnie as well as the rest of my family have passed away. I am the only one left. man oh man!!!! what a great video of the Blair Bros. lumber co….I really enjoyed it ..Brought back a lot of memories of stories my relatives and mom and dad and my own experiences as a kid..my folks met at Blair’s old mill when it was in Pollack Pines and my mother and grandmother and aunt were the cooks and my dad was a cat skinner. Tom Moran in the movie skinning cat is my uncle.. looking forward to see again!! Tom Stowe, Did your Family Move down to 5 mile Terrace after Blair’s Sold Out ?? You have a Younger Brother, Tim ?? If So, we were Class Mates at Camino since 3rd Grade and EDHS, Class of 70..
Tom…. 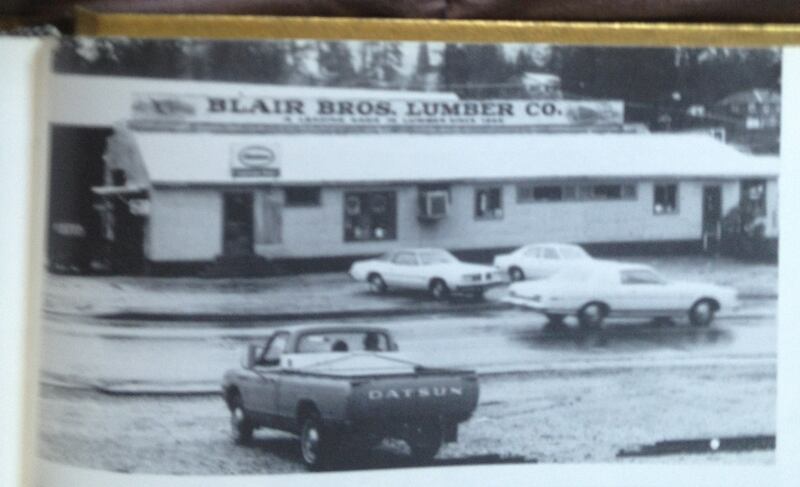 I have a History Page on Face Book, called, ” Blair’s Saw Mill” , You and Tim are Welcome to Come and Join…. Tell Tim Hi For Me, There is also the Camino History Page, and Camino School Page …..
You Will Find All Those People There…. 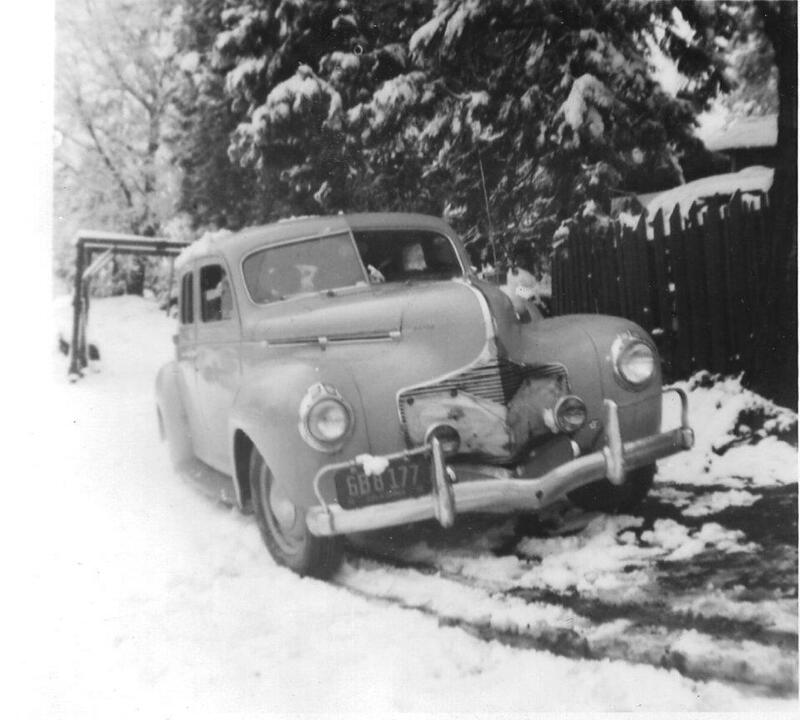 The Movie, and all The Photo’s My Folks Took ….